Naturopathic Doctor, Dr. Janet Yu is committed to helping you achieve your health goals through the use of safe and effective natural therapies. Dr. Yu provides individualized treatment plans based on your needs using a combination of dietary counselling, nutritional supplementation, herbal medicine, acupuncture, and lifestyle counselling. My focus lies in treating the root cause of disease rather than the symptoms itself. Health is not merely an absence of disease, but a balance between physical, mental, and social well-being. Our convenient location in North York’s Bayview Village Shopping Centre is on the subway line and easily accessible by car. We’re open to help you from 7 a.m. to 7 p.m., Monday to Friday, Saturdays 9-4 and Sundays from 12-5. 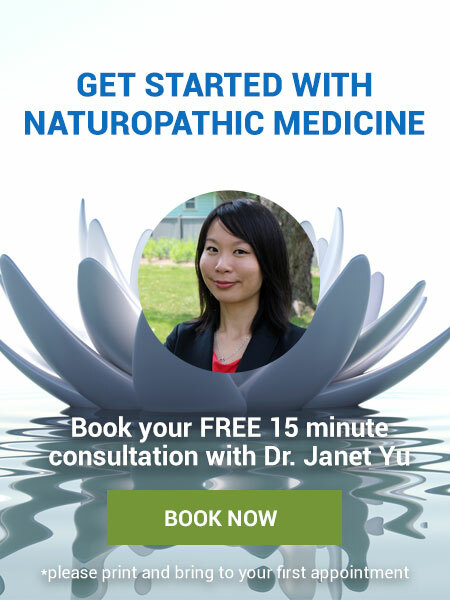 Find out how Naturopathic Doctor, Dr. Janet Yu can help you. Contact us today to book your complimentary consultation – simply call (416) 221-7724 or book online now!